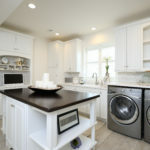 Custom Cabinetry - Kalamazoo Custom Kitchens and Baths, Inc.
A laundry room doesn’t have to be that dull, boring place where you only go to throw your dirty socks and t-shirts. 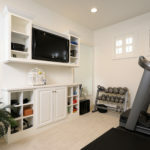 Instead, let our designers create a comfortable, cool and pleasant highly functional room you are sure to enjoy for years. 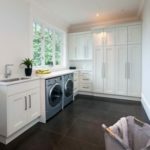 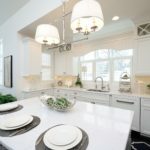 Kalamazoo Custom Kitchens and Baths are behind this custom-designed laundry room that features Corian counter tops with integrated Corian sink. 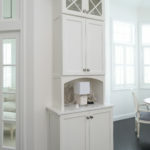 Solid dark hickory wood top on an open shelved furniture style island, sweet cabinetry design for endless storage.